In my life I have been a couch potato then an amateur Australian title holder in a team rowing sport. Yes the same person within just a few years of each other. I have also trained a team of coach potatoes to a level of local sporting success in just a few weeks. 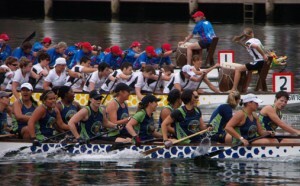 The team I coached was a corporate Dragon Boat crew made up of staff from a large Sydney law firm. They varied in age, shape and level of fitness. They were all very startled to find themselves with a coach who expected them to win. A coach who was a winner and assumed that they would be too. I didn’t ask why I had been chosen to coach. I was honored to have the job and was determined to do it to my very best abilities. Plus I was a driven and competent athlete. They were a group of novices with only 4 weeks before the race. I assumed they had asked for someone good to give them some chance at winning. Other wise they could have been given a coach who wasn’t as good nor as driven as I was. So I drove them. I did notice some surprise from them on the first night that I was being so thorough in my style and so demanding in the tasks. They didn’t complain and I chose to ignore it. Over the 4 weeks I implemented a very detailed training program. I never said anything discouraging to any individual or singled out anyone for non performance, though I had plenty of examples of both. It isn’t my style to focus on the negative. But I did continue to expect improvements and I never slackened on the pace. We spent our weeks ‘doing’. Race day came and I was ready for victory!! They were still a bit amused. I lined them up before the race into their positions. They had been lining themselves up at practice and choosing their own positions. I hadn’t interfered with that as I had felt it was more important to learn the technique fully first. But today we needed to be at our very best. Everything we could do to win was important. Luckily that day I was really angry with the world and so I was taking no crap. Someone complained that they wanted to be further up the rank. I told them without flinching that heavy strong people get to be the middle. I wanted small skinny agile people in front tall skinny people at the back. They had all been weighed at the last training session. End of discussion. What discussion? Someone laughed, the rest were deathly quiet. I said if there was anyone who isn’t going to give it 100% and expect to win, it is best they stayed out of the boat. Yes I’m serious. We will do better racing with less crew than racing below our personal best. Was there anyone here that didn’t want to give it their personal best? No comments. They very quietly got in the boat. I sat in coach position at the drum. While we were moving into position I was repeating what our strengths were and that I expected them to win. Come on you’ve got plenty of stamina I know you can do it. Yes we are in the lead. Push it now we can win. On and on I yelled. To everyone’s absolute amazement, we won!! Indeed we won by an obvious margin. Later I discovered the bloke who hugged me was the MD. The bloke who had complained about the seating was a senior manager. The two women who were in lead position where both juniors (skinny and agile). This race was a heat. It qualified us for the finals. There were almost 30 corporate crews there that day. Most like us had joined just weeks or even days before. Not one had a serious coach. There were also well organized corporate crews who had trained for months and used the sport as a regular fitness exercise. They too had amateur coaches. In the final we came second. The crew that beat us had been training together for many years and were using the sport as a fitness process and a company social bonding (drinking) thing. We did plenty of drinking (I mean bonding) too. This is a true story and has some great lessons for anyone in a leadership role whether in sport or business. This was neither the perfect team dynamic nor the ideal coach/leadership model. Reality has a tendency to imperfection. The story is still important however, as it does illustrate some of the key issues required to achieve a successful outcome. 1. A clear and highly specific goal. I mean clear! Not ‘give it a go’ or ‘try our best’ but WIN! It is usually better to have the goal clearly articulated and known to all team members. In this case, I had assumed their goal was to win. It later turned out that some of them had very specific individual goals, all of which were surpassed by their results. While getting buy-in from all members at the start of a project is preferred, it is not mandatory. c. The members provide all the required actions to complete the plan. In this case this was me, the Coach. I used my great depth of knowledge in this sport to assess in detail the available resources and developed a plan for each training session in 10 minute intervals. The individuals didn’t need to know any of these details so long as there was a good plan to follow. By them – the Coach never rows. They came to the training sessions and did their time on the water. They had worked much harder on the water than any of them had expected to and all said later that the training was as good as the racing. On a long journey (which this was not) the daily work must also be rewarding as the glory of the outcome can be too brief to provide any on-going motivation. 4. Having a qualified and specialist Coach or Leader responsible for implementing the action process and ensuring the team keeps to the plan. It can be the drawback of many teams that one of the participants is also the Coach. In the years we had won we always had a separate person who did not row as our Coach. In fact, in this type of rowing, the Coach is an extra weight in the boat to be carried by the workers. However, it still works better that way to have someone dedicated to coaching and, that they are an expert. Initially that was just me but it became infectious. Lots of members of the crew increased their dedication during training when they could see the rate of improvement. No-one had dared say that they were serious about it, until after we won the first race. But I had already seen they were serious by their demeanor and improvement in the boat at training. There is something special about working in a group. For some it is the companionship that gives them extra strength. Some people do not want to embarrass themselves in front of others. So if the Coach says we are rowing at full capacity for 5 minutes, who wants to stop before the end? For some, it is the inspiration provided by others. Either by someone who does this so well they are delights to have around or by watching someone struggling heroically against the odds. For example, in that crew watching some of the smaller people put in so much energy make you feel like doing it too. I have often trained on land alone using the same strength program we use as a group. I know that when I am on my own then 15 repetitions can seem plenty. When I train together and the Coach decides it will be 30, I’ll do it. Groups are not always easier. Just as a group dynamic can be good it can also create problems which are beyond this article to consider. Firstly, they received lots of positive feedback from me at each training session. They could also see for themselves, at each training session, that they were moving faster and further than the time before. The absolute feedback came with winning the first race. Instantly, they all thought they could do it, not just the optimists amongst them and that driven Coach of theirs. What about their drive, passion and vision? Often in corporate projects you will be working toward a given task and be expected to make the project work, despite your personal beliefs. It isn’t necessary, though it does make it easier, if everyone is personally passionate about the vision. In this case someone obviously was. That was me. A few other people were secretly almost as passionate. What is mandatory is that there is a viable plan and that everyone is genuinely committed to executing their actions effectively. While I did use visualization techniques to teach them about stroke style and timing, our results came from ‘the doing’. What will sabotage the result is if an individual reduces their ‘doing’ for any reason. If someone is holding back on the amount of effort they are contributing it maybe because they don’t share the vision. It is very hard for people to work against their own values and beliefs. If this is the case, effort must be made to align the individual’s beliefs and values with those of the project. This process need not be difficult or complicated but cannot be ignored if a person is dragging their feet and you want them to stay with the project. I was lucky with this group as they had all volunteered to participate. As it had not been a formal company requirement so they were all equally willing to do the work. It is the nature of volunteer organizations that people are unlikely to join a group that contradicts their personal needs. There was one bloke who complained about the plan (remember the seating issue) but his commitment to the team was sufficient for him to complete his actions well. As a leader, or coach, you must expect people to challenge your plan. Some people need a thorough knowledge of what is required of them, and why, in order to do their part properly. It does not mean they disagree with the plan. There may be people who are questioning the plan because they do disagree. If you cannot gain their co-operation they will become useless in the team. This event is a good example of how great results can be achieved by having a qualified coach experienced in planning, individual performance enhancement and team dynamics. Want to achieve your deepest desires? 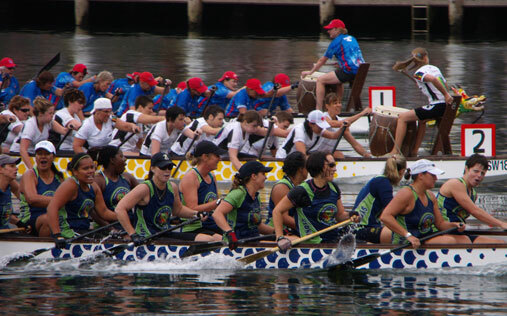 This entry was posted in Blog, Training and tagged coach, coaching, coaching for success, dragon boat racing, goals, motivation, passion, teamwork, training for success, winning by Maya Saric. Bookmark the permalink.